What Windows Startup Programs Do I Need? - Ask Leo! 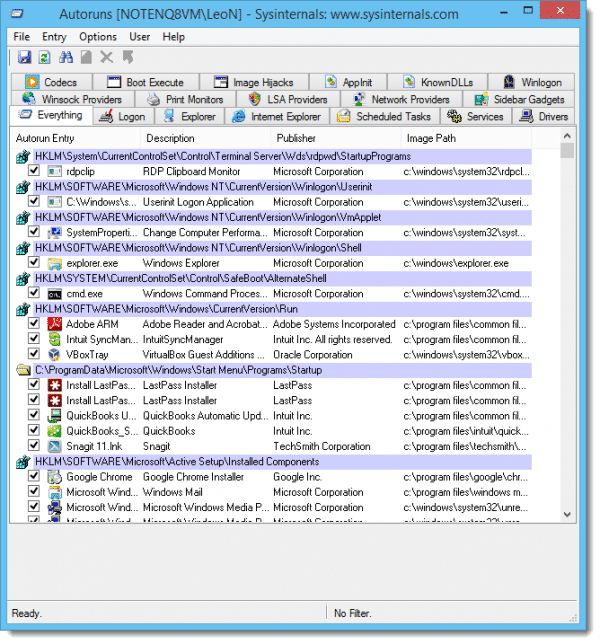 Windows startup is a complex process further complicated by the number of programs that add themselves to the list. Paring it down takes work. Ultimately, in practical terms, this is an unanswerable question. For many Windows startup programs the answer will be “I don’t know”. First, realize that there simply is no single answer. There is no “minimum set” of Windows startup programs that I could list here that would work for everyone. Everyone’s machine is different, everyone has different software installed, and everyone has different ideas of what is and is not important. So I’ll give you an overview of the steps I take when managing my startup. That’s the first of many, many pages listing hundreds individual items of interest. That’s way more than any reasonable person would want to look through, and to be honest, it includes areas that you shouldn’t touch. My first step is just a visual review of the 15 items I find on my system. I can ignore many right off the bat because I know I want them. For example, WinPatrol, BoxCryptor, BitTorrent Sync, and Snagit are all programs I’ve explicitly installed and expect to run when I log in. 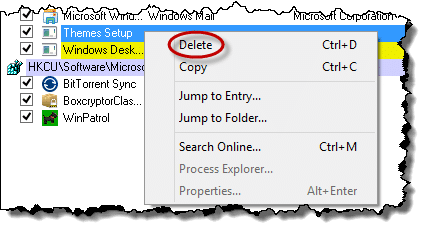 Programs like Windows Mail, Google Chrome, Quickbooks, LastPass, are all artifacts of programs that I’ve installed or use regularly – for whatever reason they’ve installed an auto-start component. Similarly Adobe ARM, the Intuit item and VBoxTray are even more obscure items that relate to software I know is running. But it definitely runs when Windows is started, as it should. Depending on your particular anti-malware program, not starting automatically could leave you unprotected until you remember to run it yourself manually. Depending on what you do during that unprotected time, you run the risk of infection. Doing this for “Adobe ARM” got me several sites with more information about exactly what it is and what it does. And this leads us to the dilemma inherent in trying to manage Windows startup programs ourselves. The utility doesn’t need to run at startup, but it provides potentially useful functionality when it does. Specifically it’s the auto-update utility for Adobe Acrobat, and potentially other Adobe products. By leaving it running, updates will at least be offered, and possibly installed, automatically. By disabling it, we take on the responsibility of doing so ourselves. So should you disable it? I don’t know. I wouldn’t expect it to be very big or particularly impactful, and it does provide a valuable service1. On the other hand it’s yet another Windows startup program. In this case I left it alone. Now, repeat that research and decision making process for each of the items you’re not certain of, and you’ll get a sense for the amount of effort it might take. And to be clear, if as part of this process, you run into something where your research turns up things you don’t understand or aren’t certain about, then the best advice is to leave that entry alone. As you saw above, I actually deleted the two erroneous entries in my startup. Don’t do that for otherwise valid entries that are simply unwanted. 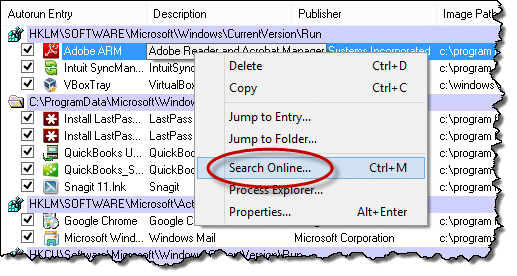 First, if you discover a Windows startup program that you recognize as having something to do with an installed application, investigate the options in that application. Many will include some kind of an option to “start with Windows” (or other Windows startup terminology). Not only can you then quickly and easily disable the Windows startup program if you so desire, but there will probably be information in the application or its online help that tells you why you might not want to. If no such option exists in the application, then it’s back to autoruns we go. That disables the item immediately. I would not delete the entry completely in case you need to re-enable it after you understand the side-effects of having disabled it. And as you might infer, you can re-enable the item by returning to autoruns and checking the checkbox. Now, one annoyance that I’ll warn you about up front: some programs are extremely persistent. You may stop a program from starting automatically only to find that the program has reset that later when you run it manually or when you take an upgrade or a patch. Personally, I find this extremely annoying and borderline arrogant. However, I have better things to do than to keep monitoring this kind of stuff. Unless the program is truly expendable, I’ll typically leave the autostart setting in place if it’s going to be that annoyingly persistent. Alternately, if I can live without the offensive program, uninstalling it completely also resolves this issue – permanently. In my honest opinion: no. In practice this can be a lot of effort for very little return unless you’re experiencing a problem and are trying to diagnose a solution. It’s very tempting to want to have a “lean and clean” machine, and I can totally understand that. The problem is that most of these startup items are minor offenders in the big picture. Sure, some might take up visible space in the notification area, but that’s about as bad as it gets. Most use very little memory and almost no CPU. Most are nearly benign. That’s not to say that many might be totally unnecessary, because in concept many – if not most – are. The services that they perform could be designed completely differently so as not to require software to be resident all the time. The vendors have chosen to write their software this way. It’s annoying, and it’s unnecessary. In general, I don’t think it’s worth the time and effort to try and pare it down beyond the obvious. How do I keep a program from loading at startup? - Be careful what you disable from starting up with your computer. You might end up with unexpected results. 1: Though I disagree with the technique of using a startup, run-all-the time program for this type of functionality. A periodic task that runs perhaps only once a day at some other random time might be more appropriate. They even include processes associated with malware, which can help if you are troubleshooting a virus infection or similar issue. get a little technical, but it’s a great resource. Your answers are down-to-earth and comprehensive. Thanks. Good article I thought. Alas as an old age pensioner I just use the start up in CCleaner. While this might not be perfect it does in general speed up computer. Also is very simple and in my opinion is a good alternative for the average user. Soluto is a useful free program for monitoring start up programs. It lists Removable Apps, Potentially Removable, Required and Removed. It lists the start up times for each application and gives the options and recommendations for delaying or removing from boot . I have knocked nearly 2 min of my start up times by using it. It also lists frustrations caused by program failures and other useful system information. It is simple and delightfully clear. Yes, I use Soluto and it is an excellent option. It’s safe… if you make a mistake you can undo it easily. The ‘delay’ option is also fantastic. I was looking for a program to organize my start up boot. I downloaded Soluto but I cannot find any information of controlling start up. It seem to be more related to monitoring a network. Did I download the wrong thing? where can I get the correct version? I have no problem in using this program for years. but why wasn’t it made to be easier to use? The program does not install, you have to extract it to a folder of your choice, no mention of it being a portable version. And you are required to delete things one at a time. There should be an auto delete of all yellow items. The other items are up to you and a Google search. By the way, what purpose does the file autorunsc.exe serve? it brings up a msdos window and closes the Window. 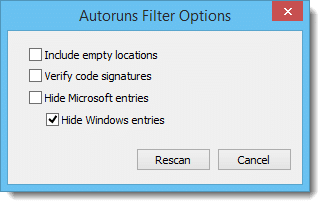 It’s a command-line version of Autoruns – open a windows command prompt and run it in there. The Autoruns menu includes Image Hijacks, on which I find 10 entries. Doing some research indicates that I have problems here. Since these are Registry entries, is it safe simply to delete them? One site 6 years old mentioned a registry called ” Image File Execution Options” and suggests these entries are to be removed using the Image Hijack tool . For instance, one entry, HKLM\Software\Wow6432Node\Microsoft\Command Processor\Autorun, actually checking it, Autorun does not exist in the tree. There are 5 entries, none of them Autorun. If you have Win Patrol set correctly, it will warn you when I program wants to be added to startup, and gives the option to accept or reject the change. and remove the check mark on what you do not need to start with Windows. It will remain available to use but only WHEN YOU NEED IT. Ccleaner now has a “start up” select option under tools. Fairly easy for the home user ..just un-select a few at a time if not sure and check for results. Make sure only one virus scanner is running at a time and get rid of any search programs other than Google. …hijacked search and home pages is more prevalent than viruses these days and has deleterious results to speed.